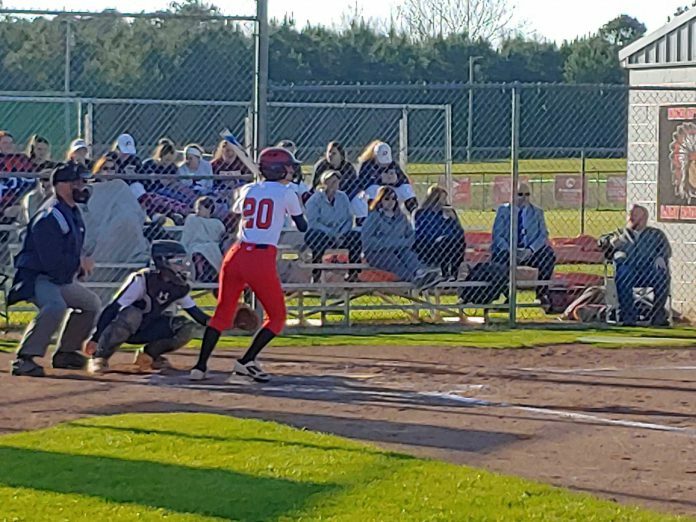 GOOD HOPE, Ala. – Oneonta traveled to Good Hope to take on the Lady Raiders in an area matchup and they were sent home with a 13-3 loss. Good Hope struck first in their opening at-bats as Morgan Goodwin led off the inning with a triple and later scored on a wild pitch. After a Skylar Tucker double, Bailey Swann reached on an error by the center fielder, which allowed Lexi Hayes to score. Angelina Flanigan added a sacrifice fly to make it 3-0. Oneonta got on the scoreboard in the top of the second on an RBI double, but the Lady Raiders made it 4-1 in the bottom of the third on a Sidnie English sacrifice fly. Goodwin added an RBI double in the bottom of the fourth to increase Good Hope's lead to 5-1, but the Lady Redskins made it interesting in the top of the fifth as an RBI single, followed by an RBI double, made it a 5-3 contest. The Lady Raiders, though, countered in their half as Abby Hunt hit an RBI single, Kailee Shikle added a sacrifice fly, Goodwin hit a two-run single, Tucker hit an RBI single, and Swann ended the game with a three-run homer to put the final score at 13-3. Goodwin finished the game with three hits, three RBIs, and she scored two runs for Good Hope (13-3). Swann added a pair of hits, three RBIs, and she scored three runs. Tucker ended up with three hits, an RBI, and she scored a run. English, Flanigan, and Shikle each added an RBI. The Lady Raiders will host Ashville on Thursday. Addison made it 3-2 after one as they scored on an error and an RBI double, but the Lady Jackets put up five runs between the third and fifth innings to make it a 8-2 advantage. Addison put up three runs in the bottom of the sixth inning to close the gap, but the deficit proved to be too much for them at the end as they wound up falling, 8-5. Madison Aderholt finished with a pair of hits, an RBI, and she scored a run for Addison, while Lexie Cunningham and Lauren Seymore each added an RBI in the contest. In what was a pitcher's duel at Cleveland, Kyla Aaron provided the only two runs of the game for Cold Springs as she hit a two-run homer in the fourth inning, and Anna Freeman Voce pitched a complete game four-hitter as she struck out four and gave up just one run. Aaron finished with two hits and she scored a run, while Hayden Goodwin, Kylon Hamby, Crimson Gann, Voce, Lacey Rice, and Emma Black each chipped in with a hit. In what was a back-and-forth game, Cullman got the best of West Point at the end as they scored three runs in the bottom of the fifth and added one more in the sixth. The Lady Warriors added one in the seventh to make it 7-6, but they didn't get any closer as Cullman wound up taking the game, 7-6. Carlie Burnham (one run scored) led the way for Cullman with three hits and three RBIs, while West Point's Sydney Sellers (one run scored) also finished with three hits and three RBIs in the game. After battling back from an early deficit to tie the game at five in the top of the fifth, Fairview saw their chances of winning slip away in the bottom half as Ashville put up seven runs, and then added five more in the sixth, as the Lady Aggies wound up falling, 16-5. Allyson Wooten (three hits) and Daisy Manasco (one hit) each finished with two RBIs and they each scored a run for Fairview. Vinemont took a 4-1 lead after three innings, but Holly Pond battled back in the fifth and sixth inning to tie the game up at four. The Lady Eagles, though, won it in their final at-bats as Mackenzie Lawrence delivered a two-out, RBI double that allowed Vinemont to take the game, 5-4. Lawrence led the way for Vinemont with two hits, three RBIs, and she scored a run. Kaylee Stallings, Alexys Smith, and Emili Perry each finished with a hit and an RBI for the Lady Broncos.